Virgin Galactic is preparing for a new flight test Thursday that aims to fly higher and faster than before toward the edge of space. The U.S. company run by British tycoon Richard Branson is aiming to be the first to take tourists on brief trips into microgravity. Virgin Galactic's fourth flight test on the VSS Unity is scheduled for Thursday, weather permitting. The flight will take off from a spaceport in Mojave, California. The vessel does not launch from Earth but is carried to a higher altitude — about nine miles (15 kilometers) high — attached to an airplane. 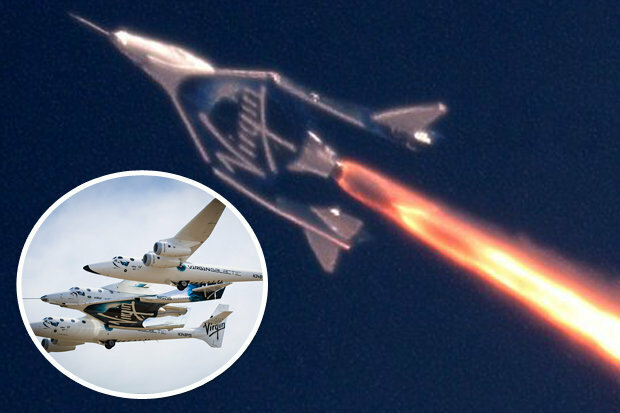 Then, two pilots on the VSS Unity fire the engines toward the frontier of space, typically defined as an altitude of 62 miles (100 kilometers). In July, after burning the rocket motor for 42 seconds, the VSS Unity reached a height of 32 miles, a part of the atmosphere called the mesosphere. Commercial airplanes typically fly at an altitude of about six miles. The VSS Unity reached a top speed of over 1,530 miles per hour, or beyond Mach 2. "Overall the goal of this flight is to fly higher and faster than previous flights," said a statement from Virgin Galactic. "If all goes to plan our pilots will experience an extended period of microgravity as VSS Unity coasts to apogee, although — being pilots — they will remain securely strapped in throughout." Another U.S. rocket company, Blue Origin, founded by Amazon CEO Jeff Bezos, is also racing to be the first to send tourists to space, but using a small rocket to get there. Virgin's first flight date has been pushed back multiple times, following a test flight accident that killed a co-pilot in 2014. Branson told CNN in November he hoped to send people to space "before Christmas." More than 600 clients have already paid $250,000 for a ticket.